The Supreme Court affirmed the legality of Republic Act 9355 or the law creating Dinagat Islands as a separate province from Surigao del Norte. "The Supreme Court has upheld the legality of Republic Act No. 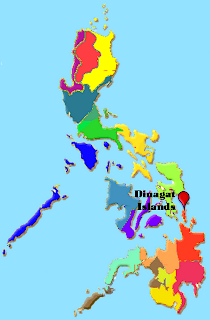 9355, the law that declared the Dinagat Islands in northeastern Mindanao as a separate province from Surigao del Norte. In an en banc resolution last September 11, the high court denied a motion for reconsideration filed May 24, 2011 by petitioners former Surigao del Norte politicians Rodolfo Navarro, Victor Bernal and Rene Medina seeking to reinstate a Feb. 10, 2010 ruling declaring RA 9355 as unconstitutional. The February 2010 decision was overturned on April 12, 2011 when the majority took back their earlier ruling and decided to uphold the legality of Dinagat Islands provincehood. Critics have since branded the reversal as a "flip-flop," to which then-Supreme Court spokesman Midas Marquez said: "In the greater interest of justice, you can always consider each particular case." The reversal prompted the petitioners to file the motion for reconsideration last May 24, 2011. But in its latest ruling on the case, the high court ruled: "The Court Resolved to DENY WITH FINALITY the said motion for reconsideration as no substantial arguments were presented to warrant the reversal of the questioned resolution." In October 2006, then-President Gloria Macapagal-Arroyo signed into law RA 9355 otherwise known as "An Act Creating the Province of Dinagat Islands." A new set of provincial leaders was later installed as a result of the May 2007 elections. In November 2006, a month after the Dinagat Islands became a province, Navarro's group filed a petition for certiorari with the Supreme Court, seeking to nullify RA 9355. The court dismissed both their petition and a motion for reconsideration. The petitioners later filed yet another petition for certiorari which the high court eventually granted on February 10, 2010. Consequently, the ruling not only voided RA 9355 but the election of its officials as well. The petitioners insisted the Dinagat Islands could not be made into a province because it has not met the requirements set under Section 10, Article X of the Constitution and of Section 461 of the Local Government Code (LGC). Section 10 reads as follows: "No province, city, municipality, or barangay may be created, divided, merged, abolished, or its boundary substantially altered, except in accordance with the criteria established in the local government code and subject to the approval by a majority of the votes cast in a plebiscite in the political units directly affected." Under the LGC, an area could be turned into a province provided that it has an average annual income of P20 million and either of the following: It has a "continuous" land area of at least 2,000 square kilometers; and a population of not less than 250,000 people. The petitioners stressed that Dinagat Islands at the time had a land area of 802.12 square kilometers and a population of only 106,951. The government argued that the Dinagat Islands should be exempt from the LGC requirements since they are composed of several islands and not just one "continuous" territory. But the high court, in the February 2010 ruling penned by Associate Justice Diosdado Peralta, sided with the petitioners: "The land area requirement shall not apply where the proposed province is composed of one (1) or more islands,” is declared NULL and VOID." But in a later ruling, the high court pointed out why the exemption from land area requirement only applied to units smaller than a province and not to provinces themselves. "There appears neither rhyme nor reason why this exemption should apply to cities and municipalities, but not to provinces," the majority said. The high court said that while the LGC's exemption only covered municipalities and cities, provinces were later included as well as "expressly provided" in Article 9(2) of the LGC's Implimenting Rules and Regulation (LGC-IRR). The high court described the non-inclusion of provinces from the land area requirement exemption as an "inadvertent omission." "Thus, when the exemption was expressly provided in Article 9(2) of the LGC-IRR, the inclusion was intended to correct the congressional oversight in Section 461 of the LGC – and to reflect the true legislative intent. It would, then, be in order for the Court to uphold the validity of Article 9(2) of the LGC-IRR," the court said. Among the dissenters in the Sept. 11, 2012 ruling were Peralta, Chief Justice Maria Lourdes Sereno, and Associate Justice Antonio Carpio, Arturo Brion, Martin Villarama Jr, and Estela Perlas-Bernabe. In his dissenting opinion, Carpio said the petitioner's motion for reconsideration should have been granted and that the February 2010 should be reinstated. "To validate Dinagat Islands’ provincehood, the majority skirts around these minimum statutory requirements by the simple expedient of exempting Dinagat Islands from the minimum land area requirement (while still conceding its non-compliance with the minimum population requirement)," Carpio said. Carpio said there was a reason why Congress had particularly not given any exemption in the land area requirement in creating provinces. "Congress intentionally fixed the minimum land area equirement for provinces because provinces host cities and municipalities, which have minimum land area requirements," he said. G.R. No. 180050 (Rodolfo G. Navarro, et al. vs. Executive Secretary Eduardo Ermita, et. al.) Acting on the Motion for Reconsideration (of the Resolution dated April 12, 2011), dated May 24, 2011 filed by counsel for petitioners, the Court Resolved to DENY WITH FINALITY the said motion for reconsideration as no substantial arguments were presented to warrant the reversal of the questioned resolution" Carpio, J., dissented. Sereno, C.J., and Peralta, Brion, Villarama, Jr. and Perlas-Bernabe, JJ., joined the dissent of Justice Carpio."